Since employees who walk out the door cost their companies up to 200 percent of their annual salaries to replace, retention is one of the most important issues facing businesses today. 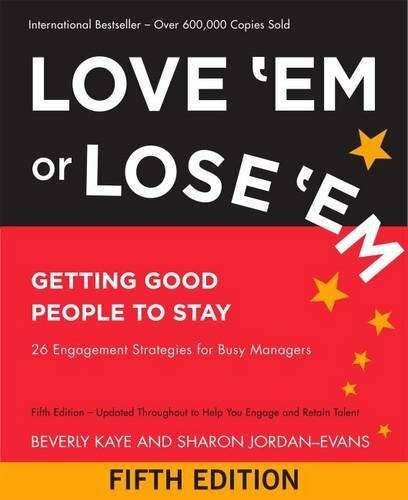 And with so many surveys reporting that employees are unhappy and not working up to their full potential, engagement is a second serious and costly issue. The latest edition of this Wall Street Journal bestseller offers twenty-six simple strategies—from A to Z—that managers can use to address their employees’ real concerns and keep them engaged. The fifth edition has been revised and updated throughout and includes many more international examples, reflecting the fact that Love ’Em or Lose ’Em is available in twenty-two languages, from Albanian and Arabic to Thai and Turkish. Its message is truly one that spans continents and cultures.